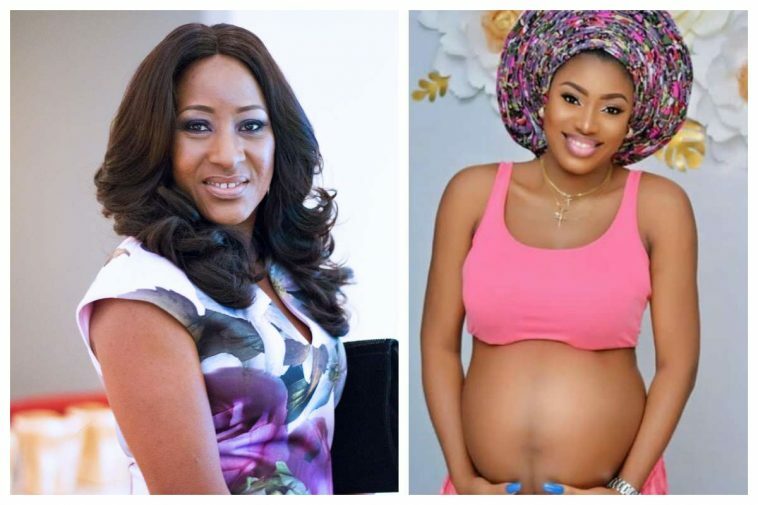 It's no longer rumour but a reality that Nollywood actress, Ireti Doyle has just welcomed her first grandchild. Ireti Doyle took to Instagram account to announce that her daughter, Abimbola Kachi Ozofor has given birth to her first child. Abimbola Kachi Ozofor and her husband Kelechi got married in the year 2014. JABANNA TANYA ONYEULO you will grow up and read this letter cos the internet never forgets which is why am writting it here. You are My jewel, my crown, my joy, my answered prayers, my greatest achievement, my peace, my laughter, my supernatural gift from God. WITH MY MOUTH FILLED WITH PRAISE AND HANDS LIFTED HIGH IN PRAISE TO THE LORD, I ASKED FOR YOU FROM LORD, IN PRAISE YOU WERE CONCEIVED, IN PRAISE I CARRIED YOU WITH EASE IN MY WOMB FOR NINE BEAUTIFUL MONTHS, IN PRAISE YOU WERE BORN, IN PRAISE I WILL BRING YOU UP IN THE WAY OF THE LORD THAT WHEN YOU GROUP YOU WILL NOT DEPART FROM IT. IN PRAISE YOU WILL BE BETTER THAN ME. IN PRAISE YOU ARE THE FIRST AND NOT LAST. IN PRAISE YOU ARE THE HEAD AND NOT THE TAIL. IN PRAISE YOUR GENERATION WILL CELEBRATE YOU, IN PRAISE YOU WILL FULFIL DESTINY….IN JESUS MIGHTY NAME, AMEN. Baby J like i always call you everytime you give me those your left kicks as i was told by my doctor that you have long legs like your mama🤣 oh yes darling, you kicked the hell out of me🤣 Your conception and birth brought me more closer to JESUS, so i owe it to you to love you with everything i have and i am. Your birth gave me a voice and made me a complete woman. From today miluv, nothing else matters. For everytime i look at you JABANNA i see God and i see possibilities. With you i will never doubt God nor his promises. I will live for you and be the best Mom will be forever proud of. Ada m, everything about you is PERFECT❤ i can’t believe you came out me. The things i didnt have, you will have, the things i lacked as a child, you will never lack…..for as long as i have breath in me, you will be a very happy child and God’s own.